Ever wondered what treats of off-road riding might lurk in those big blank bits on the map between Llandegla, Penmachno, The Marin Trail and Coed y Brenin? 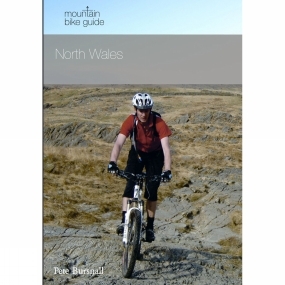 Well, take a trip back to the future with Pete Bursnall's fully updated version of North Wales' first proper mountain bike guidebook from Ernest Press. It contains a carefully selected choice of 27 mountain bike routes, all of which cover real mountains, trails and bridleways beyond the bounds of the formal trail centres. The routes range in suitability from those new to the sport, through medium distance and difficulty and on to some real challenging expeditions to test your fitness, skills, navigation and even sense of humour - such as the epic 78 kilometre circuit of the Carneddau mountains� not to be undertaken lightly. This is pretty much where it all began, remembered fondly by those of us who explored the un-ridden on the first generation of fully rigid bikes in a time before helmets, decent brakes and smart phones. This edition was almost complete when Pete succumbed to cancer, which he fought furiously to the end. Matt Strickland took over the reigns, as he had been closely involved with the book, indeed featuring on the front cover.The 27 routes are in 7 areas - specifically Carneddau, Clwydian, Berwyn, Mignant and Moelwyn, Moel Siabod, Rhynnogau and Snowdon. The book has Ordnance Survey mapping for each route, and a gradient diagram. Many colour photographs are included.